Dentist Denver, NC: How Often Do You Really Need to Come In? How Often Do You Really Need to See the Dentist? Well, with World Smile Day coming up on October 5, the answer is that you should visit sooner than later! All joking aside, the team at Summit Family Dentistry is here to make sure your next trip to the dentist is a success. You may know that the common wisdom is that you should see a dentist every six months. Does this bit of wisdom hold up to scrutiny though? 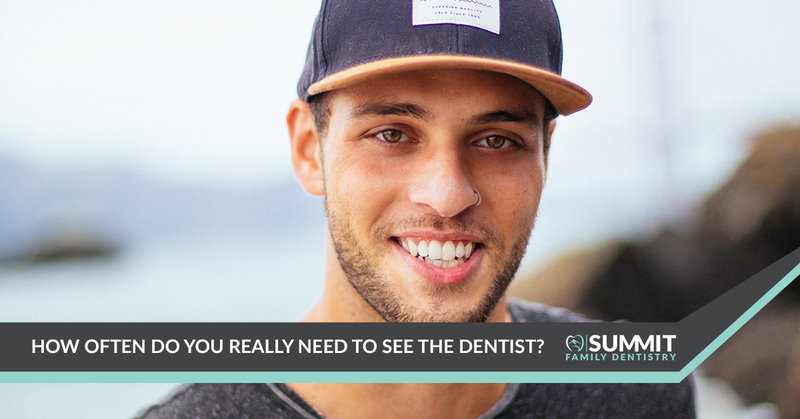 That’s the topic of today’s post so if you’re the type of person who just isn’t sure how often you should see visit your local dental clinic then today’s post is for you. Keep reading to learn more! It’s True. You Should Come in Every Six Months. We’ll just get it out of the way right out of the gate. Generally speaking, you should visit your dentist every six months. Where there be exceptions to this rule? There certainly will, but for the vast majority of people out there the six month timeline is a good one to follow. Like anything, your oral health can sometimes take a turn in a different direction, but the great thing about seeing us two times a year is that it allows us to stay on top of things. In other words, if you come to see us a couple of times a year we can catch problems before they turn into disasters. For example, you probably know that untreated cavities will inevitably turn into the need for a root canal. If we can find a cavity and fill it then the risk for needing something more serious done later goes down dramatically. Consider it preventative maintenance if you like. It’s the same concept as changing the oil in your car. You can put it off a little bit longer, but if you don’t do it all then your car is going to blow up. The same is true of your teeth. If you don’t see us about every six months, your teeth are going to explode. Okay, that’s definitely not true. But anyone who’s needed a root canal will tell you that it can feel like a bomb went off in their mouth. What we’re saying here is that seeing the family dentist regularly means that your need for a root canal treatment in the future is reduced quite a bit. Can we guarantee that you’ll avoid them? Unfortunately not, but the more often we’re able to take a look around, the better. For many there is nothing in the world quite like walking out of the dentist’s office after a deep clean. It’s a great feeling knowing that you have a clean slate when it comes to your teeth. During your visit not only will we clean your teeth, but we’ll also take a deeper look at what’s going on inside of your mouth. As we mentioned above, this is a good thing because it means that if we notice that you need to floss better between your upper left molars we’ll be able to point this out and then see what type of progress you make during your next visit. So Why Choose Summit Family Dentistry? We know that you have a choice of dentists in Denver, NC, but at Summit Family Dentistry we strive to provide our patients with an experience that’s second to none. Whether you have a fear of visiting the dentist or you’re new to the area you can count on us to treat you with respect each and every time. If you’re wondering what makes us different, the bottom line is that our number one goal is to make your experience here an enjoyable one. We know that no one particularly likes to go to the dentist, but we hope that the things we do will help to change your mind. With amenities like memory foam patient chairs, Netflix in operatories, cozy blankets, free coffee and water, and iPads for your kids to play with during your visit, you can be certain that we’ve done our best to cover every minute of your experience here in order to make sure it’s a pleasant one. When it comes to dentists in North Carolina, Dr. Pernell is among the best. Whether you’ve found us because you searched for “dentist near me” on your favorite search engine or you heard about us from a family friend, we’re happy that you’re considering scheduling your visit with us. We want to help you achieve your best smile, and with World Smile Day just around the corner, now is the time to schedule an appointment with us. Contact us today to get something on the books and we’ll be sure to figure out the ideal schedule for your specific needs. We look forward to hearing from you!